There are many benefits to retiring in beautiful Fort Oglethorpe Georgia, from the gorgeous scenery to its proximity to bustling Chattanooga, Tennessee. People often talk about attractions like the nearby Tennessee Aquarium, IMAX 3D theater, Hamilton Place Mall, and vibrant restaurant scene. However, they often neglect an even more important aspect of planning where you will enjoy retirement—the financial benefits. Kiplinger rates Georgia as one of the Top Ten Most Tax-friendly States for Retirees. They note exemptions for social security income and up to $35,000 of other types of retirement income, which goes up to $65,000 after you turn 65. With a sales tax much lower than nearby Tennessee that doesn’t include food or prescription drugs, it’s no wonder that so many seniors have decided to call Georgia home. As an extra benefit, property is assessed at just 40% of fair market value and individuals 65 and older can get some exemptions based on household income or homesteading laws. Best of all, there is no inheritance tax or estate tax. 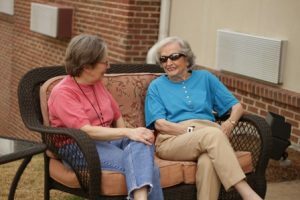 Depending on whether or not you want to retain a home or investment property even after moving to a senior living community, or how you have planned your estate, Georgia’s laws make it easy and affordable to plan how you want to. On top of the many tax breaks, Fort Oglethorpe also has a very low cost of living associated with many Southern states. Because it is located in North Georgia rather than in Chattanooga proper, many general expenses are lower than they would be otherwise. Fort Oglethorpe is an ideal blend of big city fun and country affordability that will make your retirement just peachy.